Why Can’t I Find Proof That My In-Laws Were Married? Marriage Register for Logan County, W.Va.
Editor’s note: This column has been updated to reflect additional information received after it was published via a reader of Tracing Your Roots. We love the fact that the column inspires readers to continue the research on their own! Orlando Henderson Sr. and Sterling Nelson were, in fact, married in Lawrence County, Ohio, in 1947. One of our readers, Lisa deGruyter, found the marriage record on FamilySearch in the Ohio, County Marriages, 1789-2013 database. Henderson is listed as divorced; they were married by the Rev. H.L. Smith. I need your help unraveling a couple of mysteries about my in-laws and the 1940 census. First, I have trouble finding my father-in-law, Orlando Henderson Sr., in the 1940 census. The rest of his family I can find, but not him. He was a coal miner for 44 years, so perhaps he was enumerated with the coal company? Second, my mother-in-law Sterling Nelson is listed in the 1940 census (West Virginia, Logan County, Logan District, Unincorporated Place Coal Branch) as single, 19 years of age, and living with her mother, Susie White. Sterling Nelson had two children at the time: Cordell, born Oct. 7, 1938, in Detroit; and Orlando Jr., born in 1940, probably in West Virginia. However, I do not see them listed in the 1940 census with her; nor can I find where or when she and Orlando Sr. were married. Now, here’s where it gets really interesting: Orlando Sr. is listed in the 1930 census (West Virginia, Logan County, Township, Logan Magisterial District, Unincorporated Place Peach Creek) as married to Alberta Smith. They married that year. I cannot find record of his divorce from Alberta Smith, although she did remarry a few times. My mother-in-law Sterling told me a strange story a few years back that there was a local preacher who married folks, but after a coal miner died and his wife was trying to claim insurance, it was discovered he could not legally perform marriages. It was a big mess because people found out they were not legally married. Now Sterling is 95 and suffering from Alzheimer’s disease, so I cannot go back to her and get more details, but I’m thinking that may have happened to them, too. Sometimes, when information is tough to find about an ancestor, it’s fruitful to focus on people related to them who have left more of a paper trail. This is the approach we took. Along with some immediate answers, it also opened up paths for additional research you can do on your own. First, we’d like to point out that although you were unable to locate Orlando Henderson Sr. in the 1940 U.S. census, you could always conduct a page-by-page search for him in both the Coal Branch and Peach Creek towns in Logan County. It’s possible that his name may have been transcribed incorrectly, and therefore would be difficult to find via a broad census-database search. You can access copies of the original 1940 census pages via the National Archives. You may want to search city directories for Logan County beginning in 1940, if they’re available. The Harless Library, located at Southern West Virginia Community and Technical College in Mount Gay, W.Va., “houses the West Virginia collection of books and materials on the Appalachian area,” including genealogy resources, according to its website. It may have such directories, or its staff could tell you where to find them. Additionally, you can search newspapers for information about births and marriages, as well as obituaries. The local paper, The Logan Banner, has served the area since 1888. If you are still unable to locate Orlando Henderson Sr. in 1940, then you can do as we did: expand the time frame of your search and look at other family members to gather more contextual information and establish a timeline. We noted that Orlando Henderson’s birth record, found in an index on FamilySearch, was linked to the website for the West Virginia Division of Culture and History. 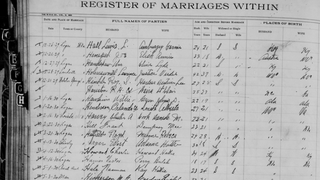 This website has searchable databases for birth, marriage and death records. We were able to locate the marriage record for Alberta Smith and Orlando Henderson. According to their 1930 marriage record, Orlando was age 27, therefore born circa 1903; Alberta was age 21, therefore born circa 1909. It was the first marriage for both, and they were married in Logan County. Orlando was born in West Virginia, and at the time of their marriage, was living in Peach Creek. Alberta, born in Virginia, was living in Logan County. The names of their parents were also included in the record; her parents were Roy and Lucy. Additionally, this marriage record included the name of the clergyman, since the marriage record stated that Alberta and Orlando were married in Logan by J.G. McNeeley. While this is not necessarily the same preacher who would have married Orlando and Sterling Nelson, assuming a ceremony was performed, it might help to search for more information about this minister and his church to see if any useful records exist. We did search for a marriage record for Orlando and Sterling, but were unable to find them in this database; nor did we find a record for Orlando Henderson Jr. However, it’s possible that the name of the son was spelled differently in his birth record or he was born elsewhere (like his brother Cordell) or was listed under a different surname (like Nelson). As you noted, you found Sterling Nelson listed in the 1940 census in the home of her mother, Susie White, but not with her children. We decided to see where we’d find Alberta Smith in 1940, so we searched census records for her under the name Alberta Henderson. We found an Alberta Henderson, age 27, born circa 1913 in Virginia, residing in Adkin, McDowell County, W.Va., in the household of Robert L. Robinson and his family. She was listed in the census as housekeeper. Alberta was listed as married, but the “M” was crossed out, and added to the space was a “7.” According to a post on the blog Ancestor Roundup, this notation means that the person was under age 55 and his or her spouse was in another household: “Even when a marital status of M[arried] was recorded, clerks were instructed to interline the M and replace it with 7 if no spouse was included in the household, thus resulting in this entry: M 7. If you find a 7 in the marital-status column, or an M crossed out and a 7 penciled in, then look for the spouse in another household.” So if this is the same Alberta Henderson, she was married in 1940, but living apart from her husband. Interestingly, her surname was still Henderson. Another important feature in 1940 census records is the column that lists the person’s residence on April 1, 1935. On this date, Alberta was living in another town, one that had less than 2,500 people, in McDowell County, W.Va. Keep that in mind if you search city directories for her and/or Orlando Smith. We then located an Alberta Smith Henderson, aka Alberta Henderson Farrington, Alberta Jones, and Alberta Smith in the U.S. Social Security Applications and Claims Index, 1936-2007, available on Ancestry.com (subscription required). According to the index, she was born in Virginia on Aug. 30, 1912, to a Roy and Lucy. Since these are the same parents’ names listed in the marriage record, we are confident that this is the same person. The index noted that she was listed as Alberta Smith Henderson in February 1941; in January 1949, she was listed as Alberta Henderson Farrington. Although we focused on Orlando Sr.’s first wife, Alberta, we found interesting leads: If the Alberta we found in Adkin, W.Va., was the Alberta married to Orlando, we can see that she and Orlando were not living together in 1940. They may have been separated, or they may have been working in different places. If Orlando was in Logan at that time, he and Sterling may have become a couple without having been married; but we have to remember that the census was taken in April, and they may have started living in the same household later in 1940. This may also be the reason son Orlando Jr. does not show up in the census—he was born after the census was taken. You brought up an interesting idea about Orlando being enumerated at the coal company. You may want to contact the Coal Heritage Highway Authority/National Coal Heritage Area in Oak Hill, W.Va., to see if it has information about this, or at least can provide you with the names of the local coal companies in Logan County. Additionally, the Logan County Genealogical Society may be able to provide you with more information about the census enumerations. There is also the Surname index on the Logan County Surname Registrar on the West Virginia Genweb. You can search for the surname Henderson and click on the link, which connects you to the email of the person responsible for researching the name. Lastly, the West Virginia State Archives has Logan County Court Records on microfilm, in case you would like to search them for your in-laws. Send your questions about tracing your own roots to TracingYourRoots@theroot.com. This answer was provided in consultation with Nancy Bernard, a researcher from the New England Historic Genealogical Society. Founded in 1845, NEHGS is the country’s leading nonprofit resource for family history research. Its website, AmericanAncestors.org, contains more than 300 million searchable records for research in New England, New York and beyond. With the leading experts in the field, NEHGS staff can provide assistance and guidance for questions in most research areas. They can also be hired to conduct research on your family. Learn more today about researching African-American roots.